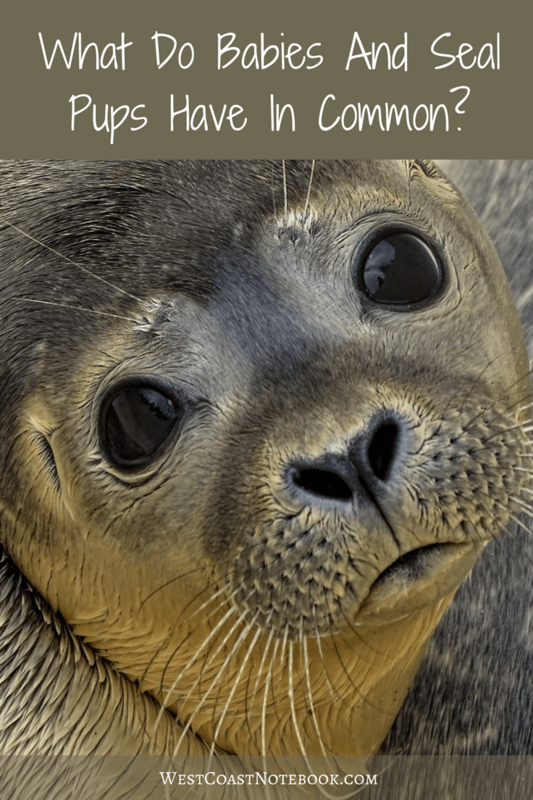 / What Do Babies And Seal Pups Have In Common? What do babies and seal pups have in common besides being small, helpless and requiring someone to feed them? Read on to find the answer. On a walk through Alyards Farm one day I discovered the similarity. Alyards Farm is part of East Sooke Regional Park and is one of my favourite places to go for a walk. 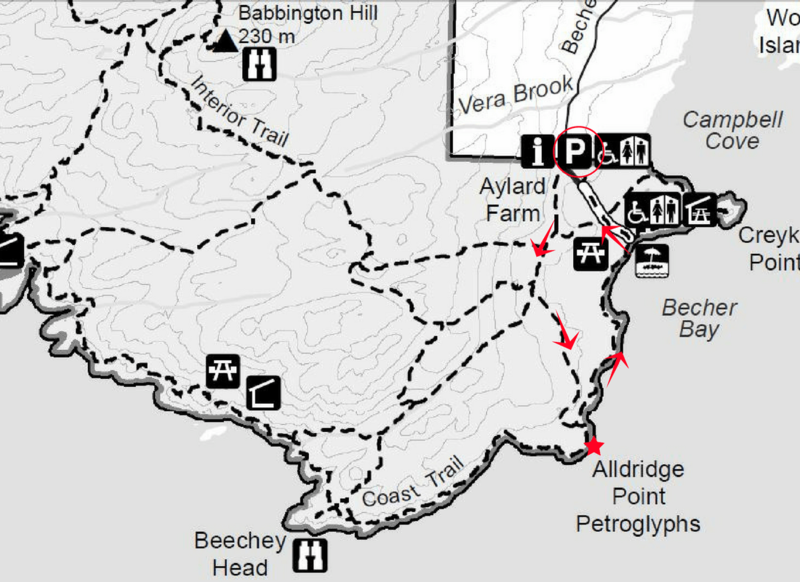 There are so many varied landscapes for you to chose to hike from beaches, fields, woods, small mountains (at least that is what they feel like) and ocean treks. This day the weather was perfect. Not too hot, cool breeze off the ocean and a really low tide. I walked out to the Alldridge Point Petroglyphs which is about an hour and a half hike. The trail through the forest heading out from the parking lot is relatively easy and cool with canopies of trees overhead. Once you get along the coastline, the path is a little more difficult as it involves hiking boots to keep traction on the rugged rocks and hilly terrain. I give it the knee test. If my knees are sore, I come back along the woodland trail and if my knees feel like dancing, I do the circle route. As I mentioned it was low tide, which is a great time to see the petroglyphs as you can actually climb down on the rock to get a good picture. It’s hard to imagine that someone, somewhere in time actually created this work of art and it’s lasted for hundreds of years. Even more synchronistic is that it happens to be a seal. 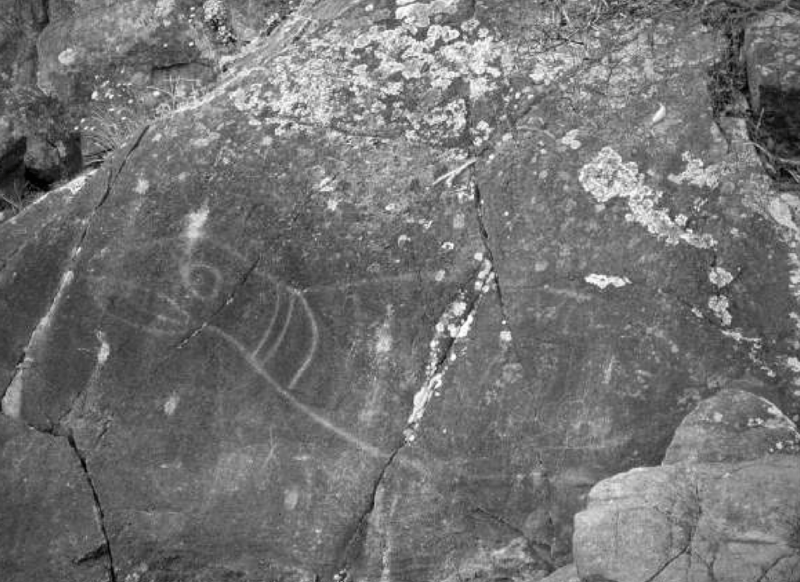 Here is a picture that I had taken on another trip out to the petroglyphs as I forgot my camera this trip. After stopping to admiring the scenery I started walking along the coastal trail towards the parking area. The views are spectacular with the Olympic Mountains seen across the strait with about 18 miles of ocean in between. Coming around a bend I heard some unusual noises. Not ones that I normally associate with the sea. It sounded more like a sheep bleating and I wondered if one had fallen down into the rocks. So I climbed down to see what it was and there on the rocks below was a little tiny baby seal pup all on its own. It was about the size of a cat and all fuzzy and furry with these really big eyes that took up most of its face. And it was in a pile of rocks and was trying to move around, looking for mom and making seal noises. And me without my camera. Can you believe it? I knew that the mom had just gone out to get food and would be back, but there was this little baby wanting some attention. I was up above it on the rocks as I didn’t want to get too near in case its mom came back so I started to talk to it. It looked up at the sound of my voice and stopped bleating. When I stopped talking it started making noises again. It was so cool. Just me and the baby seal, the ocean and the sun. Being one. After talking for a while I started to sing it lullaby’s like you would a baby and pretty soon it closed its eyes. I stopped singing and it opened its eyes and bleated so I sang some more. Whenever I stopped it would open its eyes and look at me and when I started again it would close them and be still. It was so awesome. Feeling that “Rockabye Baby” wasn’t the most appropriate song to sing to a seal I tried one of my childhood favourites “Too Ra Loo Ra Loo Ral” also call “It’s An Irish Lullaby“. This seemed to be one of its favourite songs and the pattern continued with me stopping and it opening its eyes and looking at me and when I started again it would close them and be still. It was a delightful experience. Then… one time when I stopped and it didn’t wake up. I sang it to sleep. To dream the dream of seals. Lullabies are not just for human babies, they work for seals as well. Here is a video of a man singing his baby to sleep with the same song.